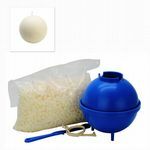 Did you know, some of our candle moulds can be used to make bath bombs as well - have a look at our Pinterest page for lots of ideas and recipes. Candle Making Kerax Kerawax 4105 Pastilles Container Blend Paraffin Wax Blend Beginner. Candle Mould Set x 2, 1 x 6 Pointed Star & 1 x Pyramid, UK Made, S7597.